The Debut 4 Bundle is the latest collection of great indie titles from Indie Royale. There are six featured games: Block Story, ASA: A Space Adventure, "Beware Planet Earth! ", Diadra Empty, Bollywood Wannabe and Undead Legions. There's also a lyrical bonus album from Vidboy: Metal Case Mental Case - for those who beat the $7 price. Block Story from Mind Blocks is a block mining game with added role playing. It features an infinite world, 25 quests, clever terrain generation, loads of weapons & vehicles and great graphics. Block Story is available for Windows & Mac via Desura. ASA: A Space Adventure by Simon_ASA is a first-person slideshow adventure game made in tribute to Riven and 2001: A Space Odyssey. You play as an astronaut in 2057 who finds a strange black cube, which will teleport him on an unknown spaceship called the Ark. You will soon discover that you're not the first astronaut from planet Terra to come here: Philip Forte lived the very same experience in 2011 and, fortunately, he left a diary explaining his story. With this help, you will visit the Ark and try to access the various environments and planets, with one single thing in mind; going back home! ASA was created by a single person for the love of puzzle games and if you're fond of the Myst or Rhem series you will enjoy this journey! ASA: A Space Adventure is available for Windows via Desura. 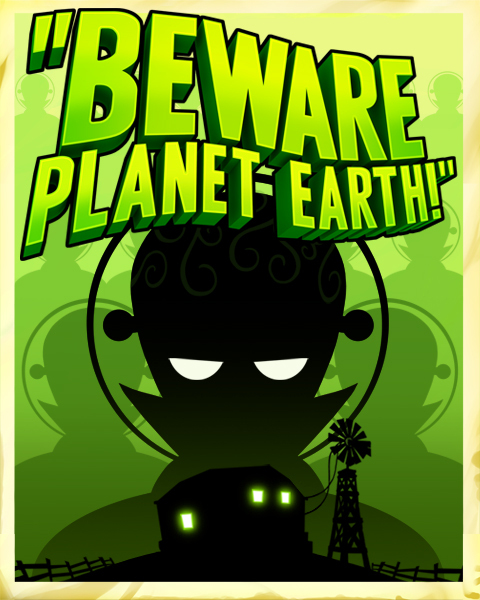 The Martians are about to strike our beloved planet in "Beware Planet Earth!" from Lightmare Studio. They're here to take our single most valuable resource: cows! Protect Barney's "ladies" in this colorful and whimsical tower defense game! It has the 46 level Full Story Mode plus 18 bonus challenges and two game modes: Veteran mode for experienced players, and normal mode for beginners to the tower defence genre. "Beware Planet Earth!" is available for Windows & Mac via Desura. Your sister is missing. On the bright side, you have a flying dragon. Diadra Empty from Rockin' Android is a free-roaming shoot-'em-up on a grand scale. Take the role of Nyalra and her faithful dragon Minimi in a fantastical quest to save her missing sister, battle legions of monsters and menacing bosses. The touching storyline is complemented by the game's beautiful 2D visuals, particle effects and environments rife with enemies, and glowing projectiles. Diadra Empty gives you extreme speed and maneuverability, huge environments in which to seize the upper hand, and plenty of firepower and upgrades. Diadra Empty is available for Windows via Desura. Do you have what it takes to be a star? In Bollywood Wannabe from Chrysaor Studio, Bollywood is about to be rocked by a fantastic new film. The producer is an unknown and his script has been rejected by every publishing house. The stars have never been in a film before. The budget is practically zero. But none of that matters - all you need to have a smash hit is passion! The passion to dance, anywhere and any time... whatever it takes to make your dreams come true. Help Kumar and Kendra make their dreams of stardom a reality with Bollywood Wannabe, a video game with a unique mix of rhythm and platform elements. Dance your way through each of the movie's scenes - can you dance well enough to make the public want to join in? Will this movie be an indie success or a forgettable flop? Bollywood Wannabe is available for Windows via Desura. Top-down undead smashing is what you get with Undead Legions from Key17Games. It's played with one of four different characters, single-player or in co-op with up to four players. Use magic, place traps, launch devastating starfire bombs, power up your hero, and be prepared for challenging boss fights. Undead Legions is available for Windows via Desura. The bundle bonus album is from Vidboy. It's the recently released, lyrical Mental Case Metal Case. Beat the $7 price to get this bonus album. You can find more information on The Debut 4 Bundle, including real-time statistics and its current price, on its official website or via its Facebook, Twitter andGoogle+ pages. "BEWARE PLANET EARTH!" PRICE DROP! Lightmare Studio and Martians celebrate Halloween with brand new DLC now available for download! And it's free! "Beware Planet Earth!" is now on Steam GREENLIGHT! Hello this just the missing wad just in case for those who has .wad errors in the game. This is only to replace gordon with luther. I hope you enjoy this skin!!!!!!!!!!!!!!!!! Please add Win 8 touch screen support (full screen). I wish you'd call it Beware Planet Earth instead of "Beware Planet Earth"
It's grammatically incorrect, but more importantly it messes up the sorting in Desura. Game always starts in fullscreen mode, despite having set it to windowed the last time I ran it. Also, shortcut keys, please. If you're gonna try and sell this on PC, that's like the most basic feature to include. Guys it does some 'idle waiting' or what? I really enjoy the game, but why it loads my cpu to 30% while doing nothing in the menu? It requires a frame limit. Please add ASAP. I had to come back and change my rating from 7 to 9. This was a GREAT tower defense. Each season gets more challenging than the next, but more entertaining too. When you're in "the zone", you can't miss. You're watching for frozen towers, or mushrooms sprouting, and collecting cogs, and using the laser to finish off enemies... it gets crazy. And then, final level, he takes your gun from you! You're all worried, but you make it through by the skin of your teeth, and then... and THEN... oh, I'm not going to tell you. You'll just have to play it and see.